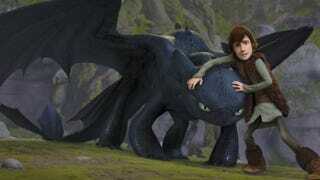 Were you offended by the ending of How To Train Your Dragon, with its dragon-appeasement? If so, you're not alone. One viewer of the movie was so incensed, he took to Amazon to complain. Thank you Least Helpful for finding this review, and for this hilarious statement: "THIS KIND OF BLEEDING-HEART DRAGON APPEASEMENT IS WHAT GAVE US HITLER."